We are celebrating 3 years in a special way! It would not have been possible to achieve all this without your support. The Fuzu journey began after we realized that traditional job market solutions, both online and offline, were outdated and not appropriately responding to the challenges of jobseekers and employers. With that in mind, we set out to make it easier for career builders to find their dream jobs and to make it cheaper and faster for employers to find the top talent they desperately need. Job and content matching is fully automated on our platform which means you get the best jobs and career guidance sent right to your email. Expanding into Uganda in 2018 - you are now able to explore more opportunities available throughout East Africa. We have over 500,000 registered users on the platform, that’s over 25,000 new users each month! - you are part of one of the fastest growing career communities in East Africa. We were identified as one of the leading innovators in the job market space by players like Disrupt100, Rockefeller Foundation, E&Y, Business Review Africa and CNBC Africa - giving you confidence to continue your career journey with us. Brilliant idea keep it up! Am glad that God has never take a break from being God. Thanks fuzu marry Xmas & happy new year. Good work fuzu n continue doing your excellent work.You are the best.Merry christmas to everyone n God blessing be with you all. Thank you fuzu team for mails about job opportunities i know one day it will be my day coz Gods time is the best time. May God bless you team. Merry xmass n happy new year full of blessings abd opportunities. IM PROUD TO BE ASSOCIATED WITH YOU FOR THE LAST 3 YEARS. ATTENDED 5 INTERVIEWS BUT NO YIELD BUT HAVE PLENTY OF EXPOSURE. GOD TIME IS GOOD TIME. thanks fuzu have been invited to five interviews without yield but i believe Gods time is always good time and I PETER 5:6 SAY HUMBLE YOURSELF TO GOOD AND HE WILL COME IN HIS GOOD TIME FOR HE KNOWS OUR DESTINY I BELIEVE THE 12 DAYS REMAINING CAN MAKE A BIG DIFFERENCE . KEEP IT UP AND GOD BLESS THE FUZU FRATERNITY. Happy feast and thanks for being for us job seekers! Congratulations, Fuzu. Happy for the goodwork you are doing. Thanks be to God the Almighty for the good services being delivered by Fuzu and i think this is not the end of your executive services to your customers including I.Lets jubilate together as we celebrate the third years of Fuzu services and existence and we are always intarch.A MERRY CHRISTMAS AND A HAPPY NEW YEAR 2019,BE BLESS AND HAVE A GOOD DAY. Congs and happy anniversary FUZU family. Fuzu your services are beyond any other related organizations locus of control for the 3 year's I have been in intact with you! Boom to greater heights is my best wishes to you! Reliable, Trustworthy, Recommendable & Resourceful. Am so grateful for this job search platform though I've not succeeded in getting a job you still encourage me to give hope I thank you and may you continue helping many people. Thank you. Congratulations for achievement made so far.. I believe there is still much in store for us.. Cheers to more milestones ahead! Congrat fuzu for your always support when in need. Cong's fuzu family. We are proud of u.Asante sana kabisa. Thank you fuzu you are the best happy 3rd birthday. Congrats fuzu, with you all the way. Congratulations Fuzu. You guys are best. Cheers! I realy thank God becouse of you. And i honour your i dear from one day to three and hope still we are going far not just hear. I bless you to serve many. May Almighty God bless you. Amen!!! Happy anniversary to Fuzu .Am also happy to be part of you. my pleasure to be part of fuzu, hopefully I will land my dream job otherwise congratulations for this great reviews seems you are impacting people positively. Congratulations Fuzu. You are the best. Fuzu Hoyeee.......Hoyeeee!!!! !.Actually what a wonderful work you are doing to help many people,so that at least they can get bread on the table and take their kids to school?Cheers and con tinue with the same spirit. I am so happy to be in fuzu for i know with i can find a job and to have a great feature in life. I am proud of you guys. Congrats! Thanks fuzu, I have been following you but I have not achieved my goal,but I believe that soon I achieve. congrats Fuzu, you are the best site though have not gotten a job yet but i believe 2019 is my year. I'm proud to be associated with you guys! I have been applying for jobs hoping that very soon God is going to do great things and happy third anniversary. Happy to be a new member. Congratulations, looking forward to a positive response. You are just worthy to be praised. I should just sing for you hossana in the highest.... Regards. The best website you will come around. Am so proud to be part of this team almost 2 years now. I want to thank you for your rewards and your efforts to make our lives easier. Congratulations Fuzu teams for your great services you are connecting Kenyan their jobs dream. I'm glad to celebrate your contents. Thank you Fuzu. Am proud to be part of you. I count on Fuzu on my mission always, i just say big thanks for the good work. Kudos fuzu.continue with that spirit as we look forward Uno to achieving from you. Tuna songa mbele pamoja ama namnagani my friends???? I scrolled down to here, very long scrolling 'coz of the overwhelming comments only to just say thank you so much fuzu and its team. I have confidence that one day I will land my dream job. Its good to Celebrate. Thanks for all. Have not seen more than one person earning an income from your job connections. Several of HR assistants from one employer kept on asking for certificates. I sent them and there is no more communication. Please let this help of job search from you have positive results. We are watching. Thanks goes to FUZU for the good service delivered to us. Congs..
Its our time to share a milestone in this dispensation. Innovation is our big brother in to days life...things are change and am happy being part of the change as fuzu member. Hail to you all and mer x-mass in advance. Thanks for everything ,you are the best keep it up,I trust in you continue with that good altitude ..
Bravo,happy birthday. Live to stay. Well done Fuzu! And congratulations. This platform according to my perspective deserves the best,however,it has helped a thousand of job seekers to get their ways out of joblessness.Big up upon you the Fuzu management. Thanks For All Your Efforts, Comitments And Struggles To Make All To Atleast Get Some Job. I Still Trust And Believe I Will Get My Dream Job Thanks God Bless All Who Have Accepted The Terms Of FUZU Happy Xmass & New Year. Making it an easy task for job seekers. Congrats fuzu. Thanks fuzu for your assistance and regular updates as far as job vacancies are concerned.Without you fuzu I could not be where I am today. Keep on with the same temple of assisting needy individuals without any discrimination or favour.Long live Fuzu. Thanks FUZU.Thats an encouragement to business starters like me. Congradulation fuzu,continue encouraging and giving hopes to young youths not yet employed. congratulations fuzu......am proud of you. happy anniversary. HBD FUZU you have been like aparent to me.May you grow abundantly. Thanks to Fuzu, I appreciate the good work and do hope to get my dream job. Kudos! Thank you fuzu.Still waiting for my dream job and I hope one day I will find it. Iam thankful to the entire fuzu fraternity and may God bless us all together. Forever a family. congrats guys. you guys are the best job platform providers. Fuzu team you guys are doing an amazing job. God bless you all. Thank you Fuzu. Even though I haven't found my dream job yet, Fuzu has made it easier to search for relevant jobs on an online platform. Very soon I know I will be sharing my good news here. Congratulations fuzu for this great achievement, you are simply the best. Happy to be part of such great family.,congrats fuzu.continue with the great work. Ok very good congs fuzu members not only founders but all of us because minus us fuzu would not gain. my request is as we plan to celebrate, let there be aprogramme designed for us to start moving on local ground telling people the importance of this. happy x.mas mood. congratulations guyz you are doing good job. cogratulations fuzu you have been amazing thanks for good work u r doing keep the fire burning! Am encouraged by fuzu after so many job sites this one has Hope...congratulations are in order. Not only have i searched jobs here but ave been encouraged that i started my own business am now an employer. Still having start up blues but soon i will be posting as an "employer" on fuzu. I really would like to extend my sincere heart appreciation to fuzu team for the work they are doing to change the lifes of people in Africa. Keep it up. Thanks. thank you, you very much welcomed be blessed for your networking. Happy 3rd anniversary Fuzu, congratulations. Congratulations to you guys..I have enjoyed your company and services. Thanks to fuzu. Looking forward to getting an HR job. Fabulous Fuzu for this for you have gone. Just keep it on toes, no retreat no surrender. I've really benefited from your services. I am very grateful to be part of fuzu family and I am looking forward to participating in the forthcoming occasions. Thank you! on digital world fuzu is at our hands making it real !! !am hoping to land my dream job with u guys,bravo en congrats. Fuzu...The time is not far when you hit the 1 Million Mark. Fuzu Team You are very inspirational and I actually draw my confidence from You Guys. Keep up the Good Work. I have attended more interviews from fuzu than any other career connection. Asante sana. We celebrate you. Thank you for the work you are doing. I am sure many have been blessed. My breakthrough will come too. Kudos!! Thank you fuzu for good work. Am proud of FUZU. Thank you. Congratulations FUZU for job well done. I bid this is the best platform for job search . May you continue to shine ! Thank you Fuzu. I am glad to be a part of you. Through FUZU I was able to get my desired job. Thank you and Happy 3rd Anniversary. Thanks a lot to all members and to all those who brought the initiative. I personally have actually benefited by developing my CV. God bless u all as we look forward to having lots of fun end grabbing those gifts. Thank you Fuzu for your updates. We celebrate with you this moment with you. Thanks a lot to all members and to those who brought up the initiative, I personally have benefited in improving my CV. God bless u all as we look forward to making lots of fun end getting rewarded. Congratulations! looking forward for the day! Congrats and keep it up!!!!!!!!!!!!!!!!! Thanks soo much Fuzu,am happy to be part of Fuzu family.. Happy anniversary Fuzu but am still waiting for my anniversary. Thank you so much Fuzu. Am a new member and am optimistic that soon am going to secure a job through Fuzu. God bless you and continue with the good job you are doing on our behalf. I thank the Fuzu faculty it is the best platform to get your dream career ... May God bless you andmay this platform grow worldwide .I appreciate you efforts , they help us grow physically , mentally and psycologically and help us in our forthcoming future. Big up for the difference you have created in our lives. This is the best flat form for job search,congratulation to the implementer. Celebreting 3 yrs of service to us? wow congratulation! Thanks alot you have been a truely reliable partner .I am proud to be a member. wow quite a milestone. Thanks fuzu for such wonderful updates. Happy anniversary Fuzu. I look forward to building my career experience with you. May God establish Fuzu as one of the best career opportunity building company. Thank you. Thank you, for you always deliver what you promise! I would like to take this opportunity to say keep the good service on. FUZU is not here just for connection but for educative, enlightening and above all motivating. From me, I say " Fuzu is a pal, an ally and a great wagon" to venture the world with. Thanks Fuzu for the 3 great years together and wish to be together for the next decades of years. Thanks Fuzu for enlightening me. Please continue with that spirit. God bless you.. I am also happy for fuzu team, uv made me updated everyday. Happy to be a user through fuzu have made a move thank you sana. thank you fuzu for the great concern over us. mwaaaest! Asante sana Fuzu and keep up the good work!! Congrats fuzu. not yet achieved but hoping for the best. Thank you Fuzu for crushing us with potential employers.Soon am confident to get my dream job through your website. good job fuzu. You got me my first job. Happy Birthday Fuzu. I feel at home and trust that my dream career will be fulfilled. Haven't achieved yet but the candle still lihts.Congratulations Fuzu. The Baby has grown! Time to make big tracks. Congratulations! The future beckons. Thank you Fuzu for your recognition. Together we grow. I believe the gift will be mine. Please continue connecting, people need you.Am waiting for Monday to be associated with Fuzu. Thanks FUZU for appreciating and recognizing us. Asante sana Fuzu Let's rock the waves. can't wait till Monday. Sure I will be successful in my journey through Fuzu. Keep it up Fuzu, we are together. Happy anniversary FUZU! Keep enlightening people and together we will move ahaed. Looking forward to the D Day. Kudos.Couldnt have been easy without you guys. Fuzu is here to help Kenyan people, so what I can say up to here I can see is soo good. Thank you too for making us available to potential employers. wow fuzu its God great ,so you will do better than before,next year we want to hear fuzu is 90% fever than the other jobs website,thanks for helping peoples. Am happy to be part of Fuzu though I haven't got job but am sure I will get Soon. Thank you for your update God bless you. you have been of great help to many people. Thank you and keep up the good work. Big up Men and thanks for being a good example that other companies Imitates. happy celebration Fuzu, you makes us proud.live long to all at Fuzu.. This has been an amazing journey. Congratulations Fuzu and many more happier birthdays. Thanks you for the feedback and the daily job updates you send via email. Am as well blessed by Fuzu for you keep me up-to-date. Grateful and thankful. I think this is the most engaging and interesting job seeking platforms i have encountered so far! well done Fuzu! Job search has never been easy as it is now with FUZU site... You get chances to choose the best job. Its has made it us choose "the best job not just better job"
Fuzu you are like my savoir. It has been easy for me to know different job sites through you. You have made life easy and I know it will be possible for me to achieve my goals. thanks! Thanks Fuzu has changed my life really, i got a job through this platform and am very happy for this team. Will look forward to the next week contest. Thanks Fuzu For Being Number One And Im Ready To Move With You Till My Final Destination. Thanks Very Much And I Congragulate You For Having Existed For 3yrs. May God Bless You. You are great and your work is wonderful. How will the contests be run? Thanks alot Fuzu for being there for me. Since i joined fuzu life has never been the same.Though still a student but almost coming out from school i have been able to improve on my career path through reading life experiences of other fuzu members, CV writing, learning about what employers really want from employees and so much more including life skills. I pray that the good Lord continue to empower and bless you as you give us more support towards our career development. And to other users, continue to use fuzu for excellence in you career. Happy birthday FUZU, many more years!. well done for the good job you are doing,I have really gained a lot from here and you are really supportive. Thanks for the outstanding effort. Bravo! Thank you too fuzu.though I haven't gotva job yet but am sure I will.keep the updates conng.happy 3rd anniversary. Thanks to the fuzu fraternity. Best I have come across so far. Real-time updates ...on point. Lots of love. Thanks for posting real jobs. Fuzu company limited has been one of my number one mentor especially in advising , advertising, and encouraging to apply new jobs from different companies across the country. I therefore salute and apriciate fuzu team staff so much , may you receive Gods blessings abundantly. Oh Wow Fuzu, thanks for being my carrier companion, What would I be without you. I like fuzu and I also celebrate with you. I am greatful for the program. Thanks a lot to Fuzu team for the support and guidelines on how we can achieve our dream. I'll encourage the team to continue giving support. Thanks again. Thank you Fuzu you have been of great assistance in achieving our goals and mission. Merry Christmas and Happy New year. Hello!fuzu has been very supportive. Thanks Fuzu for always putting us in check.I,m glad to be part of the team. It has been a good and a supporting plan to come and put your branch in Uganda,though j have not yet got my dream job but j thank you for being kind and give information on job adverts jam sure any time j will get. Thanks for your work .And j wish you doing well for this five years. I am more than happy to be part of this ever growing and exciting community. A good initiative FUZU team and congratulations for the milestones you have achieved, I Athanus King'oo am one of your beneficiaries and I thank you guys very much however there's need of you doing a lot of marketing and inform a lot of youths to join your website on my side have tried to link my friends but still a lot needs to be done for creating awareness that fuzu exists and it real helps a lot on connecting jobseekers with employers, thanks a lot once more. Thank you.... i for sure appreciate your work @fuzu and i am happy to be part of the team celebrating the milestones achieved. Quote "Listen and learn from the master". It is well elaborated that ""
That will be a great achievement. We have seen tremendous growth of Persons through Fuzu at the same time changing the lives of people directly or indirectly in the positive way by advising them how to grow, getting jobs for them. Thank you for your extra professionalism and experience in changing many lives of people. Keep it Up, give life and show the light to many people. thank you Fuzu team, am hoping and believing to get my job through this site soon. God bless #teamfuzu. I like Fuzu a lot. They are trustworthy. They don't ask for money to get you a job,they don't post vague jobs. Fuzu has been the best choice of today's generation. I like Fuzu my choice today and the days to come . 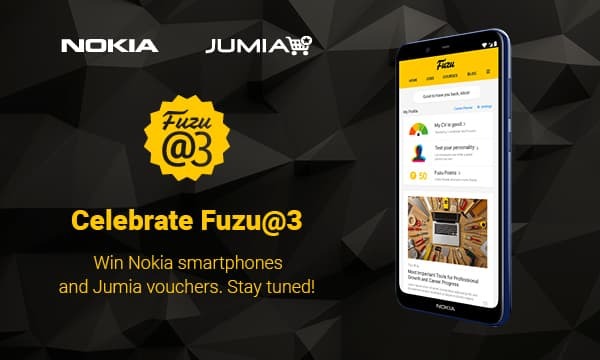 I celebrate 3 years of Fuzu. I hope to win a Nokia phone,can't wait! Congratulations FUZU!! Happy Birthday and keep on doing the good work and creating a platform for people such as myself to be seen,heard and get a chance to fulfill our career ambitions. Asanteni sana! You are doing a great job. Not goten a job though but I get encouraged when I hear of those that have succeeded to get one through you. Fuzu you're an amazing job site with well filtered offers depending on one's area of specialisation. We appreciate. Great job fuzu. Thank you for bringing the best job updates to the people who needed them most. Forever a family! Cheers to 3! Online job searching has for a long time not been going well for me and I was about to give up until I was introduced to Fuzu, and that was my turning point. Am now employed thanks to this amazing site.#happy 3years anniversary. I celebrate you Fuzu and cant waite for my gift. With fuzu we faulu. Asanteni! this is a great way to motivate job seekers. fuzu is a blessing. thank you. will be participating. Thank you Fuzu for the great work that you are doing. Your services are top notch. Bravo fuzu! May God who begun good work in you bring it to fulfillment. I really like fuzu thank you very much ,congratulations for three years. At one time of my life i was washing windows. Somebody asked me what i usually do and i told him that i deal with transparent walls. Fuzu have really changed my life for the career guidance I got and now am earning and am expecting more. For the updates I always receive, I share with my friends and family and 50% have gained and thus joined for the regular job updates. Happy Birthday Fuzu. With you we glad More years for the greater generation benefit. wow!truly i like fuzu updates.Do not forget me please. This is such amazing. Fuzu forever. Am proud to be part of Fuzu family. Fuzu is the best ,thumb's up guys. Waiting for the fun part. Happy birthday FUZU!!!! I sincerely appreciate fuzu for making life easier:There's no need for me to go searching for the job physical to the companies, I just get all the updates from fuzu. Waiting for the contest... Hope I'll get some rewards. An innovative and amazing platform . Good job guys . Asanteni sana . Well done fuzu. Thanks for your work. Thank you Fuzu team and congratulations as you turn 3. I am happy and proud to be part of your large family. Your comments It is an excellent platform, but I have not yet found my dream job. I am hopeful. Keep on the good work. It has been a good support from you on the information and guidance.thank you and we still continue working together. Fuzu gives you the job advert that you want and even goes ahead and reminds you when expiry date is approaching. Wow! It's always a pleasure. Happy Birthday Fuzu!! Thank you very much Fuzu . though I haven't been successful in job applications but ,I believe through your help one day,I will come to be successful. Thanks, Weldone as I wait for my gift. Please all the best and keep the fire burning. The information delivered are so vital and encourage the fuzu team to keep it up.